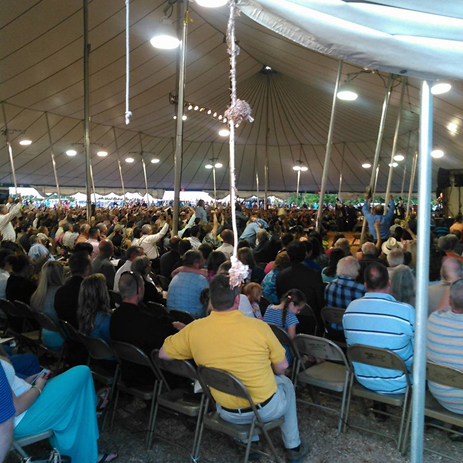 Heaven came down in Burlington, NC as a mighty movement of God fell on the week long New Hope Baptist Church summer revival that extended to an incredible 12 weeks. 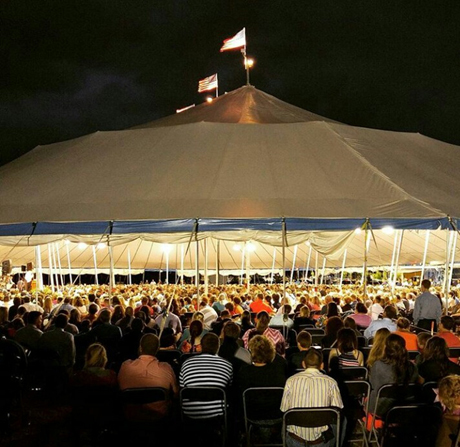 After four weeks, the revival became a tent meeting and was the first one live streamed on social media. People across America and around the world were touched by this historic outpouring of God’s anointing power. “The revival started on Mother’s Day night on May 8,” says pastor Randy Hobbs. “We had evangelist C.T. Townsend in previous meetings but God broke through on Friday night and we agreed that the revival should continue. Brother C.T. cancelled other meetings to extend this one and those pastors were so gracious in doing so. We had 300-400 the first week, then 700 the second week and it got up to a 1000 people into the fourth week. Our church capacity is 600. We had 100 people saved at our church meetings. So we were at the church for four weeks and we knew we needed a tent. “My good evangelist friend Ralph Sexton of Asheville, NC loaned us his tent. I had never done a tent revival and neither had C.T. It was amazing how God brought this together. We had a meeting of pastors and 49 came. We had never seen that many pastors in our area gather for a common effort of any kind. This gathering of 49 pastors was a miracle in itself but God was in this and they sensed it. 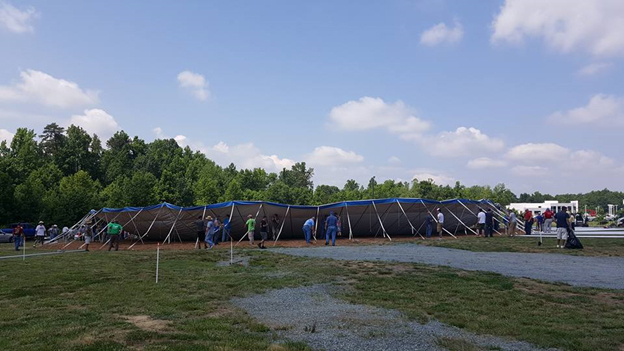 The Tent was located next to the Toyota dealership owned by Don Cox on I-40. On the final night of the 12-week revival on July 29, evangelist C.T., 34 years of age from Asheville, NC and a native of West Virginia, recalled some of the high moments. “When we started unloading the tent, the power and presence of God was here in a strong way. We had many men here to raise the tent and get set up. However, on that first day, I had a man delivering signs. I told him how pleased I was and he went on. A little bit later, I felt someone tapping on my shoulder. It was him saying ‘I’m not a Christian and I need to get saved.’ So right there unloading, not only this man but another man servicing us asked us to pray with him to be saved. So we had two men saved while unloading the tent. People drove from Tennessee, Pennsylvania, Georgia, South Carolina, Kentucky, Texas, Alabama, Florida, Montana, Kansas, Ohio, Indiana and one flew in from Hawaii to witness such a thrilling revival service. Many people were saved watching the service live streamed on Facebook. People tuned in from Africa, Hong Cong, Canada, Mexico, Chile, the Philippines, Venezuela, the UK and other countries begging God that he would send revival to their countries. A group of 18 staff members from the Billy Graham Library, including four Native Americans who serve with Lou Engle of The Call, attended the final service. We didn’t realize it would be the final service until we arrived. We were greeted by Pastor Hobbs, evangelist C.T. Townsend and youth evangelist Heath Williams. We found that the men had toured the Billy Graham Library more than once without our knowledge. 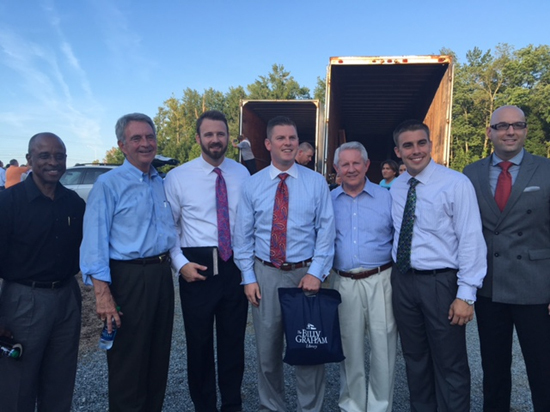 A pre-service meeting with Billy Graham staff and the revival team…l-r; John White, Tom Phillips, Jared Dixon, C.T. Townsend, Wayne Atcheson, Heath Williams and D.R. Harrison. “My best friend and I went to the Billy Graham Library three weeks ago and did a prayer walk around the building,” said C.T. “Mr. Graham has been a great inspiration in my life as an evangelist. Every time I’m there, I am so inspired and blessed. I am so uplifted and encouraged.” As he spoke with Tom Phillips, the vice-president of the Library and former worldwide Billy Graham crusade director, C.T. asked if he could bring his staff for training. When Tom graciously said we would be delighted as we have trained many other evangelists in evangelism, C.T. teared up. We related how we admired the great movement of God in Burlington and had been praying for them all along. We circled together and prayed for C.T. and the service. 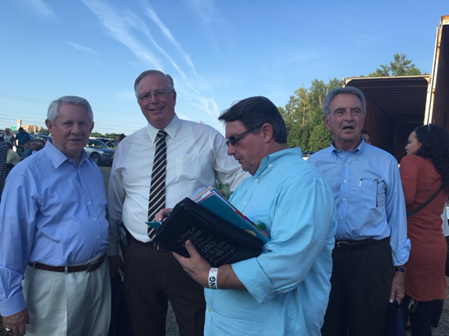 Pastor Randy Hobbs (second from left) with Wayne Atcheson, Charles Chandler of Decision magazine and Tom Phillips. After a few moments of greeting and picture taking, we were ushered to seats that were reserved for us and certainly didn’t expect front row seats. The choir started to sing at 7 pm and the pianist played gospel songs and hymns as the tent begins to fill and the power of the Lord is felt the moment you walk in. You sense there is something unusual about this gathering. Some had been sitting for three hours, and you knew that people couldn’t wait to sing about Jesus and rejoice. People are sitting in folding chairs, the huge fans are blowing and the floor is heavily padded with wood shavings throughout. A great number were rejoicing because they had been wondrously saved in the meeting. Song leader Jared Dixon, a young man like C.T., stepped to the old fashion wooden church pulpit to lead the first song. He said three words and was so overcome by the Holy Spirit that he couldn’t speak. He put his two hands on the pulpit with his head bowed for what seemed like a minute before he regained his composure to lead the song. C.T. was standing a few feet away smiling and basking in the joy and brokenness of his song leader. Shouts of joyful affirmations came from the crowd. Jared would lead in hymns and gospel songs which he did throughout the revival. The crowd joined in as he led in old favorites such as “Glory To His Name,” “Nothing But The Blood of Jesus,” “O How I Love Jesus,” “Revive Us Again,” “Amazing Grace” and “I Stand Amazed.” People would stand and raise their hands in praise, and The Whisnants sang special music that raised the spirit even higher as it came time for C.T. to deliver his final sermon after three months of preaching. We were pleased when Pastor Hobbs asked Tom Phillips to have the opening prayer. Our coming from the Billy Graham Association was of great encouragement to the revival team, but it was our honor and blessing to experience such a movement of God in their revival. Half of the audience each night were first time attenders. People began to stream down the aisles. Children, teenagers and adults came forward, most every one of them in tears, and knelt at one of the five 25 ft. altars made from logs. Some came down with a friend. Others came and a counselor quickly knelt to pray with them. C.T. had the Christians to bow and pray. The altars became crowded with seekers. After several moments, a young woman wailed to the top of her voice not one time but three times. It wasn’t for her salvation but for her seven-year-old daughter who had just invited Jesus into her heart. The mother had seen her child get saved and was so overjoyed that her wailing could be heard throughout the tent. As the invitation continued, you could hear wails at other altars. Someone told C.T. that a pastor’s wife had just gotten saved, and he announced that to the crowd. The pastor expressed his joy dancing around up front as a couple of friends came and embraced him. As C.T. was continuing the invitation, he noticed his father, Rev. Kenny Townsend, and mother Debbie were at the altar with his own adopted brother who was about 11 years old. C.T. went over and knelt with them and talked and prayed with him as he received the Lord into his heart. The invitation song continued while the evangelist was kneeling at the altar for several minutes. The invitation lasted about 45 minutes, and it was reported that 65 people had been saved on the final night. You could sense how difficult it was for the leadership to draw this 12-week revival to a conclusion. Pastor Hobbs thanked C.T. and so many people and then C.T. had his family of three children to come on the platform and his parents, plus so many who had worked faithfully and diligently to make the revival possible. Pastor Buchanan who had led the pastors’ nightly prayer movement, gave the closing prayer to this historic revival event. The average attendance under the white canvas tent was 2,500. The tent location was only ten minutes away from the New Hope Baptist Church. Early on in the revival, C.T. asked businessman D.R. Harrison to edit and produce a video for him. As Harrison watched the video over and over, he became under conviction and gave his life to Christ. He had not attended church in 11 years. Several weeks later in the meeting, he went forward and told the crowd that God had called him to preach. He is starting his first meeting this month and has received other invitations. He also became a key leader for the revival team. It was a special blessing when a Muslim man came to the revival and invited Jesus Christ into his life. He was later baptized in a local church. Also, a man from Jamaica came to the revival and was saved. Pastor’s wives and even church members were saved. A young evangelist came from Texas and then two more times just to experience this mighty movement of God. On the last night, a man was sitting in the audience who said that he was an alcoholic before the revival, but he came and was saved and had given up alcohol. He said that alcohol money was now providing more family support. A 35-year old man drove his truck by the Billy Graham shuttle bus as he was departing. He lowered his window and proudly said, “I was saved here tonight.” He had driven with a friend from Morganton, NC and it was his first service to attend. New Hope church did indeed have what Billy Graham describes as an “old fashion, Heaven sent, Holy Ghost revival.” New Hope has truly given America revival hope and it came after years of prayer and started with a week long summer church revival. Heaven came down and glory filled the soul of every one who was blessed to attend. Most importantly, hundreds gained eternity in Heaven. To God be the Glory alone. Great things He has done! Thank you, Alonzo! Praying for a national revival of His “kids” with you!